Medium - $323.99 Only 2 left! Large - $323.99 Only 7 left! Halloween is coming up and a lot of people are going to be running around as supernatural creatures from all sorts of different myths and legends. You can bet that you’ll see werewolves, vampires, ghouls, and many varieties of demons. People will be trying to dress up as the scariest versions of these creatures but you don’t need to worry about being the most horrifying. No, you’ll be the most radiant mythological beast swimming through the party scene this year. All you need is this Women’s Siren of the Sea Costume. A siren is a creature very similar to a mermaid. One key difference between the two is that while mermaids tend to be helpful towards humans, sirens enjoy luring sailors to their demise. Also, another quick difference lies in the appearance of each creature. Mermaids have always been half-human and half-fish but the depiction of a siren has been that as well as half-human and half-bird… With this costume, however, you will be the aquatic version of this creature from Greek mythology. Now the sirens were always notorious for causing sailors to crash their ships into rocks by distracting them with a beautiful singing voice. So you may want work on your pipes if you want to properly depict these infamous beauties of the sea. 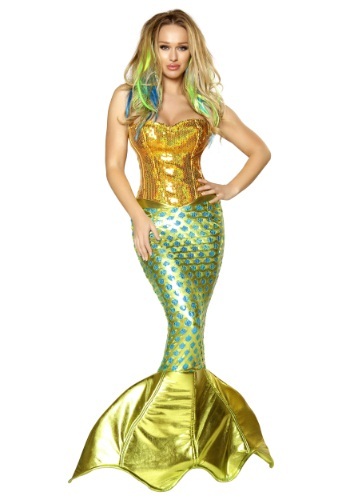 This costume comes with a glamorous corset and a V-shaped skirt with a lovely fin to cover your feet. If you want to swim the extra mile then you can even take a look at the many colorful wigs we have in stock to complete this mystical transformation. When you enter the party in this costume you’ll leave everyone like fish out of water, breathless!